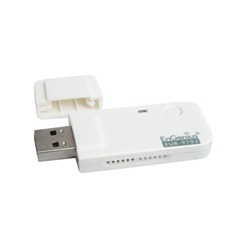 Based on today's most advanced wireless N networking technology, the EUB-9703 150Mbps Wireless Adapter is designed to deliver reliable high-speed connectivity to wireless networks, offers extended range and reduces dead spots. The easy to setup, convenient and compact adapter plugs into your laptop or desktop USB port. The Setup Wizard makes it easy to install and configure for use with your network. Push-button security setup makes joining a network secure, simple and easy. Offers Powerful Protection with support for the latest industry standard wireless data encryption to protect your data and networking activity – all with the push of a button.